Algebra: A sugarer is concerned with the rate of change in tree growth, the rate of the sap drip (determined by the pressure of the sap in the tree), and the amount of sap needed to produce syrup. Data Analysis: There are so many numbers and patterns to discover in maples sugaring. Extensive data can and has been collected and analyzed on growth of trees, perfect weather conditions for sugaring, the right conditions for making syrup from sap, product comparisons, pricing of syrup, and the patterns of production. trees appear symmetrical to the eye. 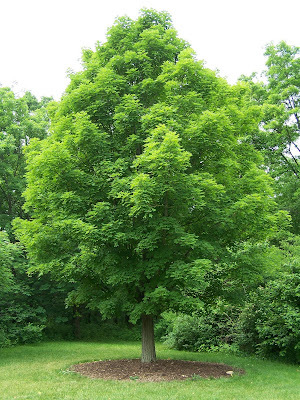 That is why so many children love to draw the maple sugar tree. This symmetry is also found in the seeds of sugar maples. Fractals abound in the structure of the leaves and branches. A sugarer uses geometry to determine which trees to tap and how many taps to use by analyzing diameters and circumferences. Measurement: Sugaring is rich with measurements. 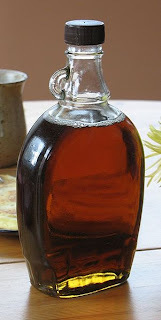 You can measure the growth of a tree, the age of a tree, the outside temperature, the amount of sap produced, the time it takes to make syrup from sap, the cooking temperature of syrup and other maple treats, the density of syrup, the weight of syrup, the sugar content of syrup, and the grade of syrup. Numbers and Operations: A sugarer counts the number of trees, the number of taps, and the number of buckets in the sugarbush. The rings of a tree can be counted to determine the age of a fallen tree. Sugarers use calculations to determine the number of workers needed, the amount of sap collected, and to estimate profits. I am a fourth grade teacher in Bloomington, IN. Sap's Runnin'! Time to go Sugarin'! Is it the Grade A Fancy Kind? Who Wins the Maple Syrup Production Race?